So one day we noticed, way up the side of a side wall of the house, this plaque. From the ground you can’t read it. To get this photo I had to hang out a side window and crank my zoom lens full out. Then I had to Photoshop like crazy to get this balance of contrast, enough so that you can sort of read the letters but not so much that the contrast blots them out. Once I got that all done, it was no surprise at all to see that they had rolled the credits: architect, owner and builder. The owner’s name according to the archive records was a M. Forgeau, a notaire and son of a notaire. The notaire who is named, is someone whose name doesn’t appear in the ownership records at all. Notaires back then had a fairly good income in addition to farming or animal rearing, which is what most people did in this area; when a property is sold, notaires handle the paperwork. Also, compared to most of the locals, they were well educated. At a time when teachers were often paid according to whether they taught students just to read, or also to write or to do math — three separate rates, paid by the parents, who were often dirt poor — a good education was in itself a mark of prestige. That said, I could find nothing online about M. Forgeau or M. Martine/Martineau/whoever. Jean Plissot, builder, meh, regular guy extraordinaire, nothing more. He must have done all right, as the one entry I found noted that he had donated work on a hospital, those being, back in the day, charitable institutions. He did a terrific job on this house, which is structurally solid to this day. For that I am grateful to him. Now we get to the good stuff. 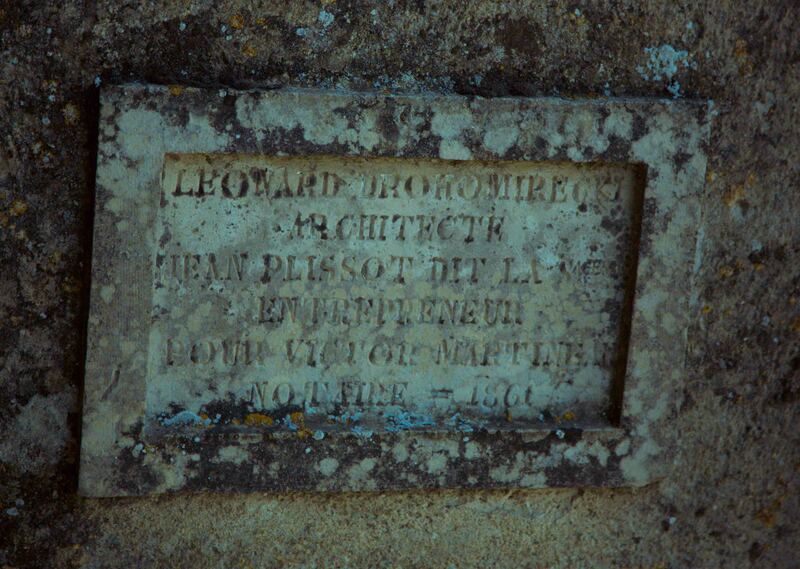 The architect was Leonard Drohomirecki. Once Kieron and I worked that out we looked at each other, two minds with but a single thought; this guy’s not French. These days, to not be French in France marks you as a permanent outsider. Kieron and I both own property here, live here, speak enough French to do most things. Most people are pretty nice to us. Others, well, Kieron had to shop around to find a dental surgeon, as the first guy refused to work on him; no way was he touching an English guy’s mouth. Kieron is an EU citizen, so at least he can work here. The French put up with me because I spend a lot of money here, no other reason. Unofficially the snobbery and xenophobia, at least toward white people, are fast fading; officially, dealing with the bureaucracy, it’s a whole other story. So I had to find out about this Drohomirecki guy. How did he get a commission for a big house like this? The answer is, he was by miles the best local guy for the job. Jacques-Leonard Drohomirecki (no, I didn’t name my dog after him, but if I had known I might have) was born in Poland on 6 November 1811. From then until 1838, I just have to speculate. I think the most likely story was that he was well-born and well-educated, probably as an engineer. He would have learned French; back then, educated people did. In 1830 the Polish people revolted against Russian rule; students and intelligentsia took the lead. The revolt failed and a lot of people had to get out of Dodge, Warsaw, Krakow, wherever, to save their lives, they just had to go. I think, oh, let’s just call him LD, went to France. He next pops up in the records I could find getting his job as Assistant Director of the division of Bridges and Roads in 1838. He obtained his permanent residence card on Valentine’s Day, February 14, 1843. By then he had become Director of Bridges and Roads for what was then called the arrondissement of Bourbon-Vendee. He was based in Fontenay-le-Comte, though I found another record that referred to him as living in Lucon. I don’t know why you would live in Lucon if you could live in a grand Renaissance city like Fontenay. Let’s leave his place of residence an open question. The point is, he had a government job and in just five years had worked himself up to a position of some importance. I think he dabbled in architecture. The railroads used to hired people as crossing guards. They would build houses for them, right next to the places where the roads crossed the train tracks. While driving around I have noticed these jewel box houses, small but extremely well proportioned and picturebook pretty. I have thought that I might try to research their design and construction. If I ever get around to that, I think I’ll find my guy LD did the design work. He would have socialized, met people like contractors and notaires. One thing leads to another — he did finally marry at age 52, to a woman from Vouvant — and deals are done. Lucky M. Forgeau and his heirs, lucky Honoré Prudhomme, who bought the house in 1940, and his family, to whom the house was passed onto and eventually, lucky me. For all my grousing about every possible thing about this project, I do love this house. Surely he designed other large houses as well. At this point I just don’t know the details. LD retired in 1879 after 41 years of service. On 14 July 1880 he was made Chevalier of the Legion of Honor. Will Kieron or I ever manage that feat? Somehow I doubt it. Absolutely fascinating! Great research work on you part to find all of these interesting details. Thanks, Gerard. Well, and thank you, Google. That they have scanned and made searchable such obscure documents is impressive. Happy New Year to you and to everyone. That is interesting, validates what you had already guessed, that your house is special. I am sure you will find out more. Gill, I think those railway houses have long since been sold off. If he chooses his area, then bides his time, he should be able to get one. They are unusually cute, aren’t they? Also, because they were placed near the rail lines they are outside the usual village/farmland system. It makes it fun to find one. I think the government is parting with the last of the unused railway stations. If he is feeling ambitious, he might want to take one of those on.